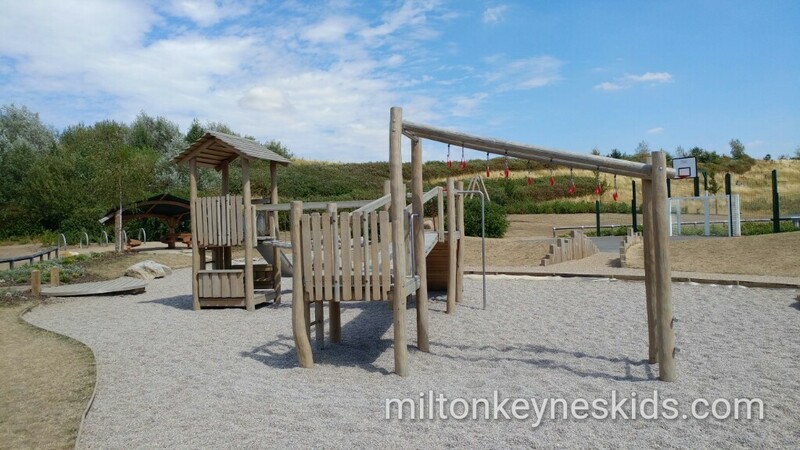 Brooklands in Milton Keynes is already home to one good park which we have frequently visited since starting this blog. And it’s with much anticipation that in 2017 we heard that another was being built within walking distance. However it felt like ages before it was finished, and then some time before the fencing was removed around it. On the day we visited in August 2018 there was still some building materials piled up and the road was being resurfaced. That said it is a good park. Watch my video below and then scroll down for more information. 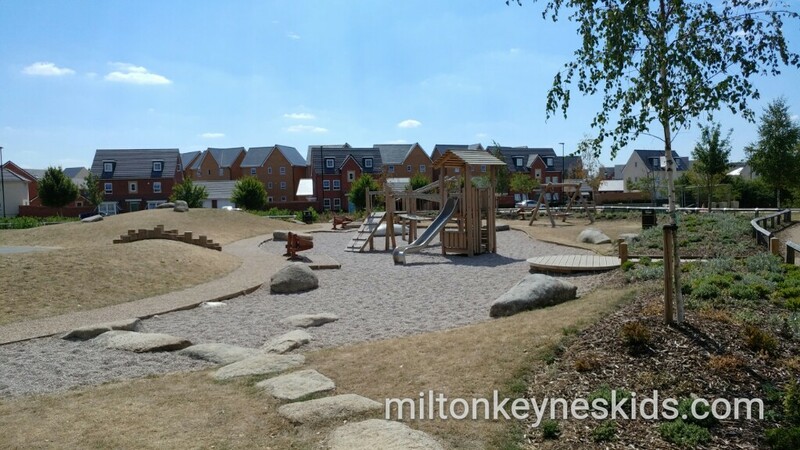 Where is Brooklands park Maritime way? 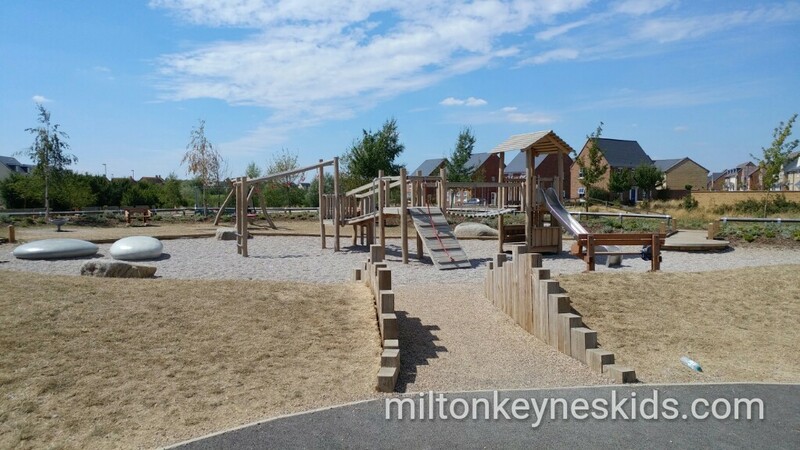 The park is located between Maritime Way and Broughton Grounds Lane. at that junction. The postcode to get you closest to it is I believe MK10 7FS but google doesn’t seem to like it at the time of writing. So you may need to try MK10 7FR if you struggle. What’s good about the park and who is it most suitable for? 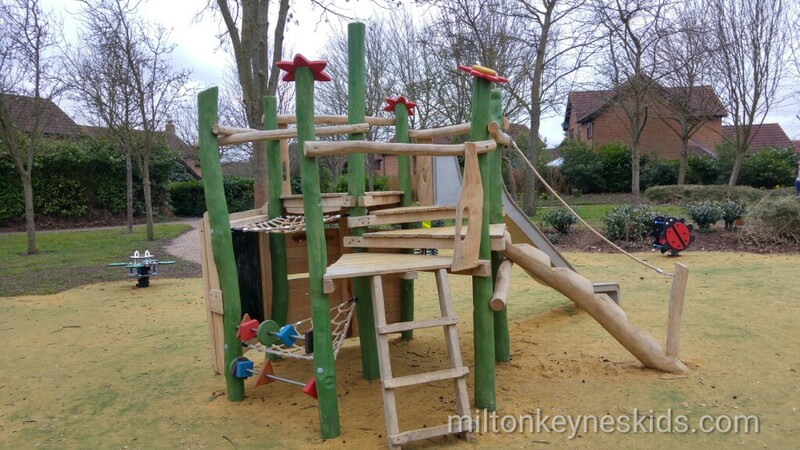 The park has a good wooden climbing frame with fun wobbly bridge and slide. My son who had just turned three at the time we visited was able to climb up it with the climbing wall bit and rope – although when we visited previously several months ago he did struggle – so if you have a two year old who’s a good climber they’ll be fine otherwise better for older toddlers. There’s also a good zipwire – again my 3 year old was fine with support. For some shade in warmer weather there are some covered wooden benches. There’s also a nest swing and spinning cup thing kids can sit in. For older children / adults there’s a basketball net and table tennis table. It’s a really good size so plenty big enough to explore. What’s not so good about the park? 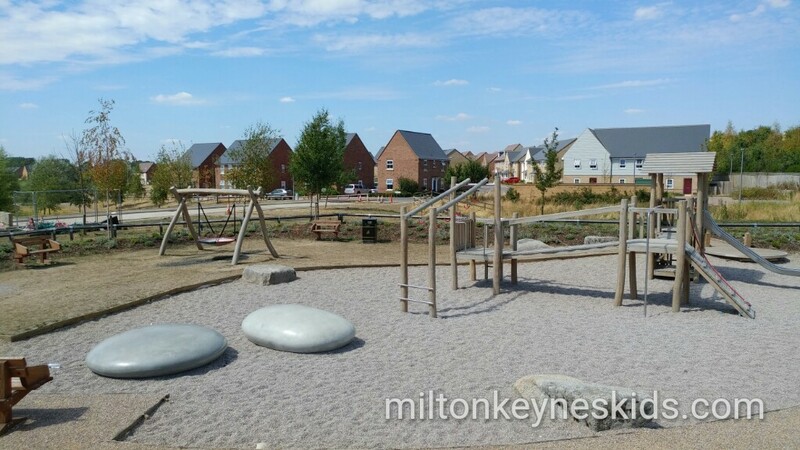 I’m not that keen on the stones – of which there are loads which surround the climbing frame. 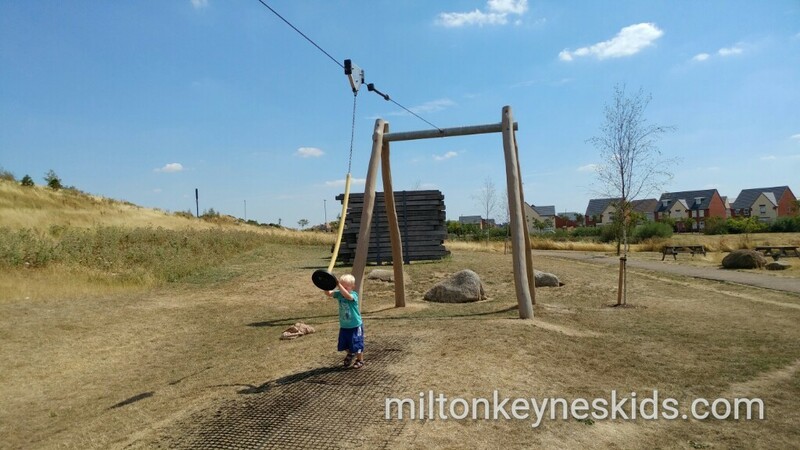 Young children might be inclined to throw them; they get all in your flipflops; and they don’t really serve a purpose – it would have been much better if they had have been incorporated into some equipment with a pulley system or buckets like at Emberton Country Park. Perhaps they’re easier to maintain than sand, I don’t know. There are too big flat grey stones which look pretty and are fine to sit on but again I’m not sure what the point of them is, they get really hot in the sunshine and are quite slippery to stand on. When we visited (Aug 2018) the road was closed and was still being finished. The park is not enclosed so you definitely need to keep a close eye on young children. Definitely go to Brooklands Meadow Park. If you have this park on your left – start walking to the right and you’ll come to it in about 5 minutes. 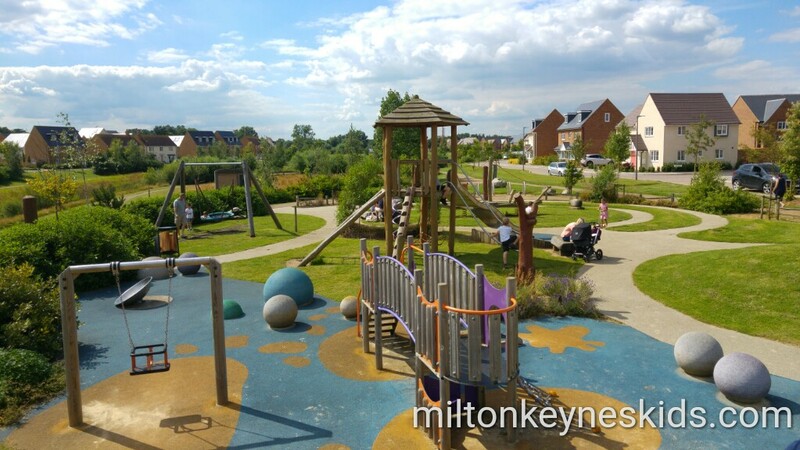 Otherwise just a short drive away is Wavendon Park. 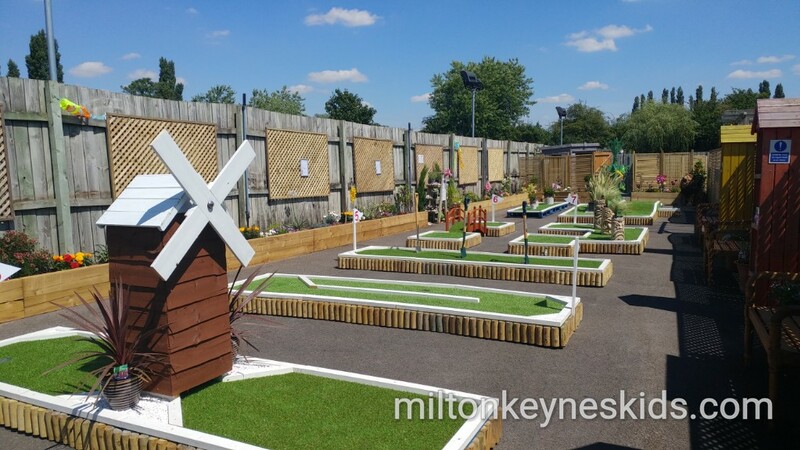 You could also visit the snail park in Walnut Tree or do the charity crazy golf at Wyevale Garden Centre. 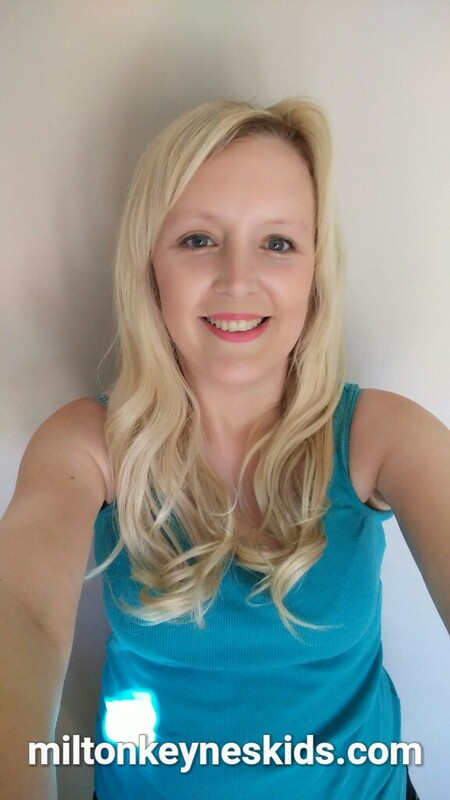 Hi Laura, it’s a big climbing structure next to the zip wire; not building material. There’s 3 structures of different heights. I assume these are what you are talking about. When we visited the park when it first opened we thought the same thing but realised they are actually part of the park themselves.